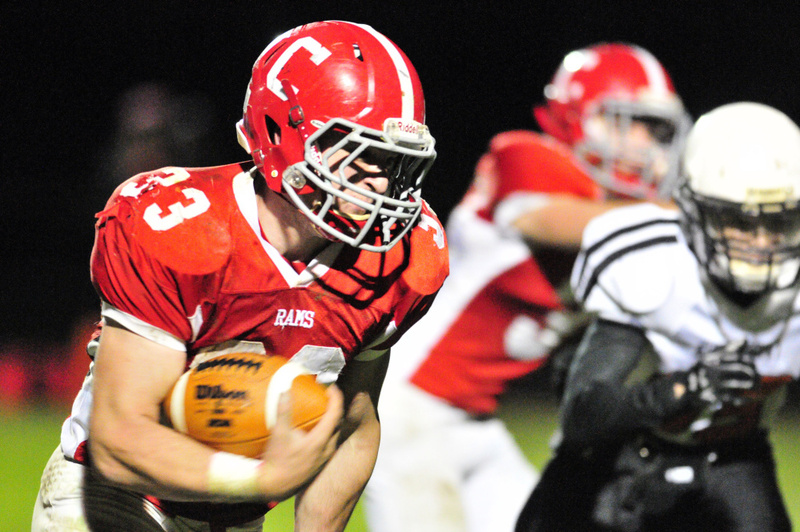 Rams, Oak Hill, Winthrop/Monmouth, Maranacook each in playoff action this weekend. FARMINGTON — For one football team Friday night, its season is going to end exactly where it began. Fourth-seeded Mt. Blue High School (5-3) hosts No. 5 Cony High School (4-4) in a Pine Tree Conference B quarterfinal at Caldwell Field at 7 p.m. in a rematch from Week 1, but the stakes are obviously much higher than what they were when the Cougars picked up a 20-6 win on Sept. 4. The Rams are just one of a handful of local teams that will be in playoff action this weekend. In the Campbell Conference Class D, No. 5 Maranacook (4-3) travels to No. 4 Winthrop/Monmouth (4-3), while top-seeded Oak Hill (7-0) hosts No. 8 Traip (2-5). For Cony, it is hoping for a much better showing this time around than when it played the Cougars in Week 1 and it’s hard to imagine a scenario where the Rams do not have a better showing. In addition to it being the first varsity start at quarterback for junior Taylor Heath, Cony was also without senior running back/linebacker Reid Shostak due to an injury in that first meeting. In the past three games, Shostak has run for 664 yards and nine touchdowns. Mt. Blue, meanwhile, enters off its most challenging stretch of the season after suffering a pair of competitive losses to Brunswick (7-1) and Skowhegan (7-1). The Cougars found success in their win against the Rams — and throughout the season, for that matter — behind a three-pronged running attack of Christian Whitney, Alex Gilbert and Zach Meader. In Class D South, meanwhile, the Ramblers and Black Bears meet for the second time this season as well, with Winthrop/Monmouth winning 17-14 on Sept. 25 at Maxwell Field on a 28-yard touchdown pass from Matt Ingram to Ben Ames with 12 seconds remaining. As was the case in the first meeting, the Ramblers know they will have to find a way to slow up Maranacook’s double wing offense when they face off Friday at 7 p.m. at Maxwell Field. One player the Ramblers will be keying on specifically is quarterback Kyle Morand. For the second time in as many weeks, Oak Hill will take on Traip, only this time the game will be in Wales at 1:30 p.m. on Saturday. The Raiders scored a convincing 32-6 win in Kittery last week behind three touchdown passes from Dalton Therrien and are approaching Saturday’s quarterfinal in a similar fashion. If the Raiders can avoid an upset, they will host either Maranacook or Winthrop/Monmouth in the semifinals Saturday, Nov. 7.